Watering your lawn during the hot months of the summer helps keep it alive until cooler temperatures arrive. 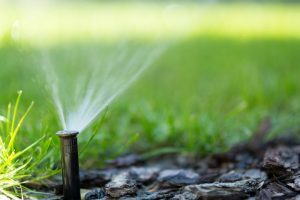 Watering your lawn during the hot months of the summer helps keep it alive until cooler temperatures arrive. But once that happens, you need to make sure your lawn will survive until the next time spring comes around. Here are some reasons why you should keep watering your lawn this fall, even when winter returns. When you continue to water all of your plants and your lawn, you encourage root growth. The leaves will be falling off trees and your flowers are drooping, but that doesn’t mean they’re completely dead. They’re just about to go dormant for the winter. This is the way it always goes. Plus, with nasty weather like high winds, less rain, and unpredictable temperatures, you don’t want your lawn or landscape to dry out prematurely. Once October arrives, it’s important that you keep an eye on your lawn. From now until March, your home’s landscape will need continued watering. That said, your plants won’t need as much water as they would during the summer months. New trees and freshly-planted shrubs, however, will need more attention. Don’t forget to test the soil to see how much moisture is still present. Water your plants around noon or sometime in the middle of the day. Just make sure temperatures haven’t gotten too low yet – 40 degrees is where you should avoid watering the plants, because that close to freezing point, any water you do add won’t do your plants much good. Once you’ve watered all of your plants and the lawn, you will need to wait a little while. This allows the water to soak into the soil; so you might have to wait 4 hours at least, and sometimes more. It all depends on when you watered, how much water you added, and whether or not you used a hose. Ready to start planning your new professional landscape design in Anne Arundel County, Howard County, Annapolis, Davidsonville, Severna Park, Arnold, Millersville, Ellicott City, Columbia, or Clarksville, Maryland? Give us a call at 410-849-5119 or send us an email to schedule your free no-obligation estimate today! Don’t forget to follow us on Facebook, Twitter, Google+, Houzz, and Youtube! This entry was posted on Friday, October 5th, 2018 at 2:23 pm. Both comments and pings are currently closed.